I can take care of one person in my family, but not two! What if my husband doesn’t make it? I can’t live without him. I’m a bad mother – I should’ve taken our son to the doctor sooner. I won’t be able to sustain caretaking my two guys and my two businesses. I’m going to lose my clients. If I take care of them, I won’t have time to take care of myself. I’ll get sick, too. I help people overcome their fears so I shouldn’t be feeling so afraid myself. There’s nothing wrong with fear itself, it’s a natural human feeling. However, fear often takes over and leaves us with the sense of not being in control and feeling overwhelmed. Most people experience fear like an out-of-control freight train. The first scary judgment often leads to another scary one, then another… and another… and before you know it, the body is flooded with stress hormones, so much so that even the emergency brake of the freight train malfunctions. As you can see with the last statement in the list above, I not only made a judgment, hence feeling fear, but I also was judging the judgment, hence the out-of-control freight train. Follow the F.E.A.R. process and you, too, will feel your calm and grounded self once again. To experience this powerful process with Tamara’s soothing voice and David’s stunning music and imagery, GET THE LOVING MEDITATION APP! F – Face your fear: The tendency is to run away from fear, but facing it not only creates a turning point, but also the courage to work through it. Become aware of the scary judgments you’re making about your situation by writing them down or saying them out loud. E – Embrace your fear: Embrace it fully because if you resist it, it will persist. Embracing doesn’t mean that you love the awful thing that is happening to you, it means that you move toward that thing that you’ve been avoiding until now. A – Allow your fear to be what it is, an interesting point of view – Get curious with what you’re telling yourself. Ask yourself if it’s even true (which it usually isn’t). You can’t be in a space of allowance (or curiosity) and judgment at the same time; therefore, releasing your judgments leads to releasing your fear. R – Radical compassion & Release – Have compassion for the one who is experiencing this fear. Tell yourself (that terrified one inside of you), “It’s okay to feel this way.” This is a very loving and compassionate thing to do for yourself, which creates the final release of your fear. 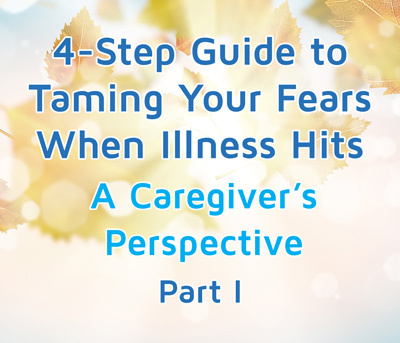 After my loved ones were diagnosed with major illnesses, I felt scared and overwhelmed and believed that my world had turned completely upside-down. However, when I followed the F.E.A.R. technique, I felt grounded, centered and right side up again. And, I was able to laugh at the crazy judgments I had been making. As a caregiver, I’m proud to report that I rose to the occasion and was there for my guys 1000%! And, I showed up for me, as well. It’s been a three years since those scary four days and my son and husband are doing great! We caught the Lyme disease in time and my husband blew the doctors away with his amazing recovery (it’s because he used the F.E.A.R. technique, too, and other powerful meditations). Tamara Green, LCSW, co-founder of Loving Meditations is an author, speaker and trainer Elle Magazine dubs as the Soul-centered Psychotherapist and Meditation Practitioner. When her son was diagnosed with Lyme disease and her husband with stage-4 cancer, it was meditation that helped them through their medical ordeal. Together, they have created Loving Meditations, programs that bring calm to patients and caregivers living with cancer and other serious illnesses.